Have you been wanting to try orienteering, but are unsure of where to start? Join us for Winter Series, beginning on November 5th! A beginner course stays on-trail, and is a good option for a family walking with young children. An intermediate course will mostly stay on trail, with short excursions off-trail, allowing you to practice reading contours and vegetation boundaries. This course is appropriate for a family with older children, teens, and adults. If you are comfortable reading a hiking trail map; start with this course. Both Short and Long Advanced courses are the same difficulty and require the ability to read more subtle map details, such as shallow (less prominent) contour features. Some routes may be completely off-trail, with no on-trail option. If you’ve completed an intermediate course and found it to be easy, then you’re ready to move up to an advanced course (*see “Going Advanced” below). Are you wondering how long of an adventure you should be ready for? Think of it this way: you can move quickly on pavement, slower on trail, and even slower when off-trail. Then, add even more time for navigating. You can only move as fast as you can navigate! As a new orienteer, you’ll likely need to periodically stop and evaluate the map before continuing on. Or you might make an accidental yet scenic detour, and have some backtracking to do. So consider your trail pace, either hiking or running, then add 50-100% more time to complete an orienteering course. Also, orienteering courses are measured as the crow flies, which is shorter than the distance that you’ll actually travel. A general rule of thumb is to round the kilometers of a course up to miles, so a 5-km course may actually take you 5 miles to complete. Very generally, Winter Series courses last between 20 minutes as the fastest time on the beginner course and the maximum time of 150 minutes (2.5 hours) for long courses. Want a narrower estimate? Okay, a new adult may take about an hour to run or 2 hours to walk an intermediate course. Before signing up for an advanced course, check out the event map description. The challenge of advanced courses is heavily affected by the event venue, which is why we’ve come up with a rating system. 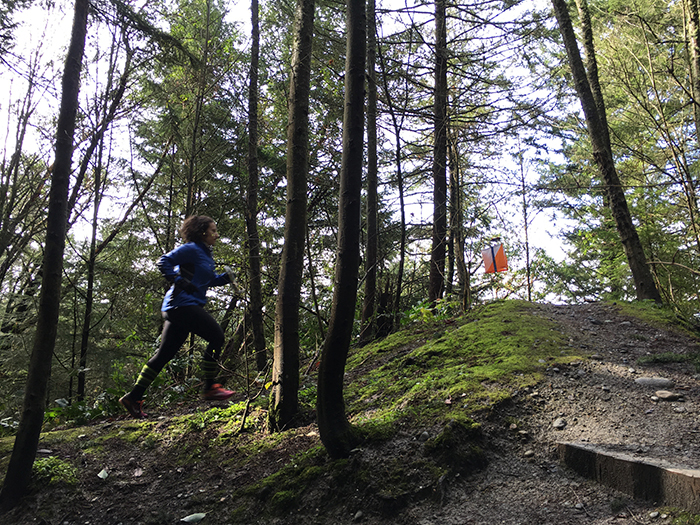 For instance, an advanced course at Magnuson Park, which is rated a navigational challenge of 3/10, will be easier than an advanced course at the trickier Fort Steilacoom (navigational challenge rated 5/10) or the more rugged Lord Hill Park (navigational challenge rated 8/10). There is also a physical challenge rating, which primarily relates to the steepness, footing, and vegetation. Are you still feeling unsure about which course to choose, or want to bump up to a more challenging course? Bring a friend! Groups are welcome, and together you can tackle more challenging navigation. Still not sure? That’s okay! Contact Rebecca, and she’ll help you pick a course. See you at Lincoln Park on November 5th!